Denise McIntyre is our Choir Director and Gene Roberts is our First Chanter. Music is an integral part of Orthodox Christian worship. Many of our services are a continuous dialogue in song between the clergy and the people. Chanters and a choir lead the congregational singing. Everything is sung a cappella. We proclaim our faith using ancient Orthodox Christian hymns in Eastern and Western styles. At St. Luke, our chanters sing in English using the Eastern or Byzantine style of chant. Our choir sings a wide variety of music from Russian, Ukrainian, Romanian, Greek, Arabic and American musical traditions. Our Liturgy is the source of our Theology. 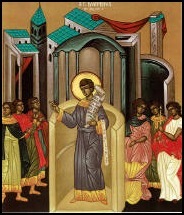 Orthodox worship proclaims a living faith in the risen Christ. In our services, you’ll hear us singing prayers and petitions and we make use of the beautiful psalms found in the Bible. We use hymns to celebrate sacred feast days and the lives of the saints. We even sing when we read the Gospels. Orthodox sacred hymns are a delicate balance of text and music, with the text as the most important component. It is our hope that you will not only enjoy the sound of the music, but that you will also get a sense of what we believe. Many of our services are a continuous dialogue in song between the clergy and the people. Read "Choir Notes", our choir newsletter. "The hymnologists of the Orthodox Church are Christians of virtue and great faith, having been endowed with musical talent as well as the power of religious inspiration. Their creations have enriched our worship services and have helped turn our souls towards God. Perhaps the greatest of all hymnologists is St. Romanos the Melodist. Many other hymnologists have written ecclesiastical hymns, but none of them inspired the Christians as much as St. Romanos." Read more about the St. Luke Choir's patron saint.